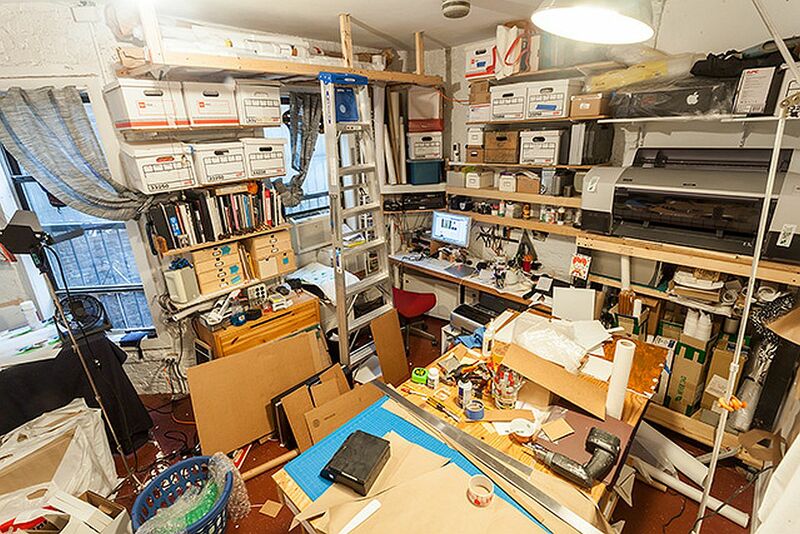 CHICAGO — The 84th installment of a series in which artists send in a photo and a description of their workspace. Want to take part? Submit your studio — just check out the submission guidelines. This is a photo of my mixing table where I mix small batches of single colors on bamboo plates covered with aluminum foil. I build images with flat areas of color in acrylic paint. The process has its built-in limitations that force me to solve a puzzle of balance and legibility in each painting. The carpet tiles are a recent addition to the studio. They are at risk where paint is ever-present, but have unexpectedly and pleasantly silenced my pacing back and forth from the easel. My painting area is in my apartment, and what’s pictured here is my painting wall. As I do not clean my brushes, it’s necessary for me to have something to “clear” the brushes on as I’m working. In the case of my painting wall, this is a large piece of canvas in front of which I hang the canvases as I work on them. Below that are my brushes and water buckets, which keep the brushes pliable, since I paint with oil. Not pictured are my collection of art books, various reference materials, photographs, action figures, or my computer station. Occasionally I will paint while listening to music or to an oft-seen movie as background noise. Sometimes one song will influence the nature of the completed painting, and titles often come in unexpected and idiosyncratic ways. Often, I work on a single painting at a time, but occasionally I will go back to a painting to edit it as necessary. As I am living with my work, this allows me to constantly engage and analyze my works, or to keep them in the back of my mind. Often, painting is akin to working out a puzzle, but one that must have a sense of narrative, harmonious dynamism, and play. 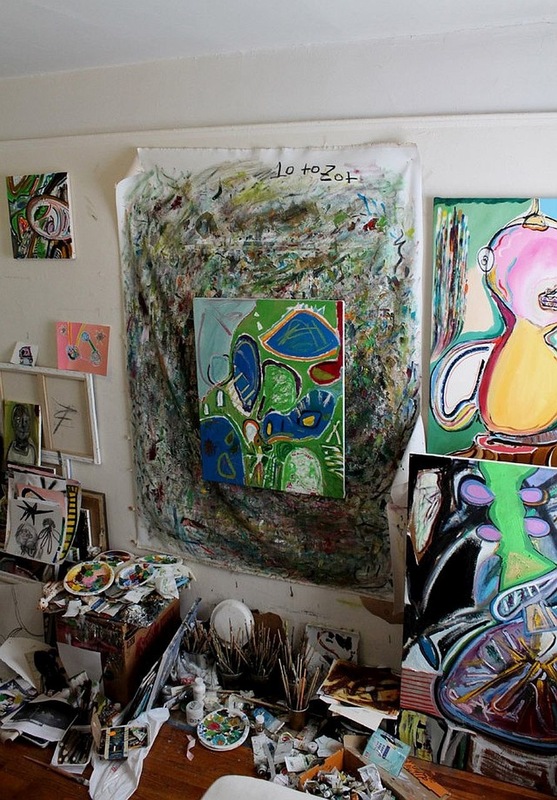 Ideally, I would like to locate a studio space that I could turn over completely to my painting process. For 12 years, I worked on my collages in the guest bedroom, but since it was upstairs next to our bedrooms, I wasn’t open to studio visits. As soon as my sons moved out into their own places, I transformed their basement playroom into a good-sized working art studio. After the sheetrock and white paint, baseboard heating, recessed lighting, linoleum flooring, and utility sink, I widened my media repertoire to include sculpture and painting. 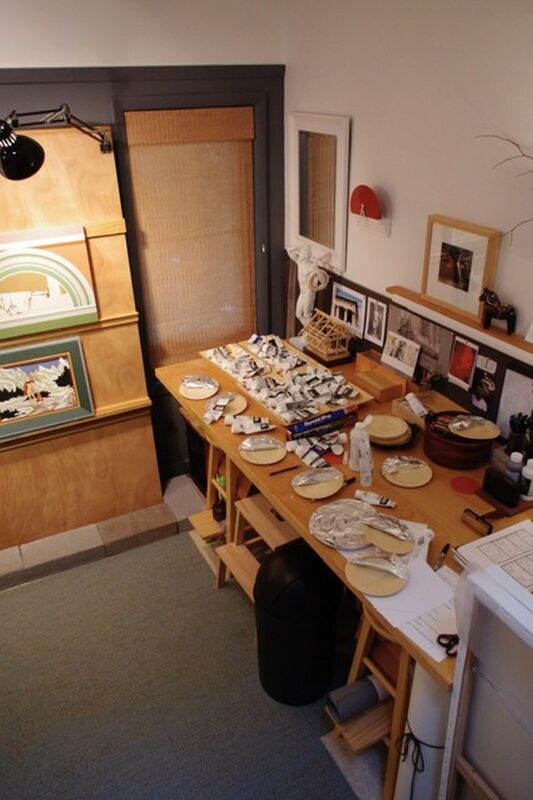 I sometimes combine different media, so I organized my studio space into separate and versatile work areas. From the left: on the top of the flat files I mold my paper machѐ pulp and polymer resin sculptures. When they’ve dried the paints and brushes are close by on the rolling table. 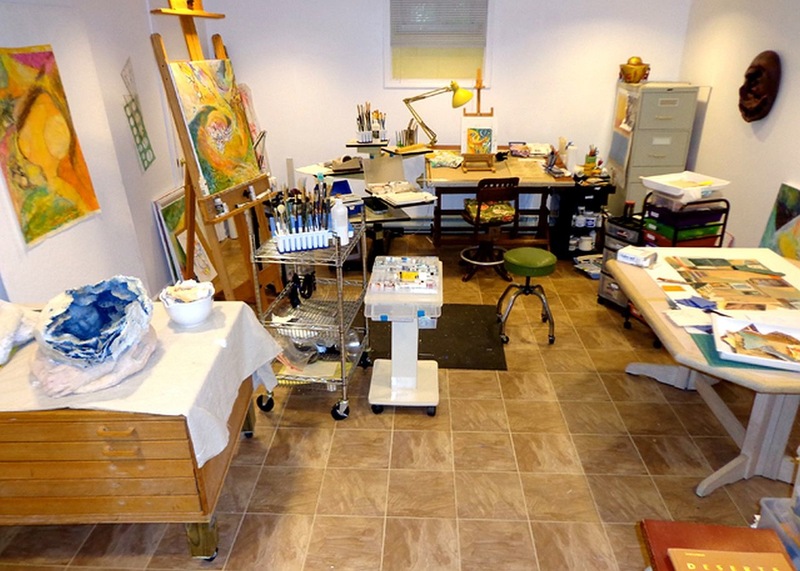 I have easy access to my paints and pallet when painting at the easel to the right. When working on large paintings on paper, I used to nail the paper into the wall, puncturing the sheet rock. An artist friend recommended nailing the painting into a homasode panel, as seen on the left side. It works well, and my walls and husband are very happy. At my drafting table along the center wall, I am currently working with collage and acrylic paint on 12-x-12-inch works on paper. My former kitchen table on the right side is the perfect size for working on large collages. I keep all my collage papers in boxes underneath the table or in the file cabinet in the right side corner. For me, this is the perfect environment for working. My studio is in a renovated building shared with other artists, architects, and musicians. I am a printmaker, papermaker, installation and book artist, and the studio is often reconfigured to accommodate whatever project I’m working on. 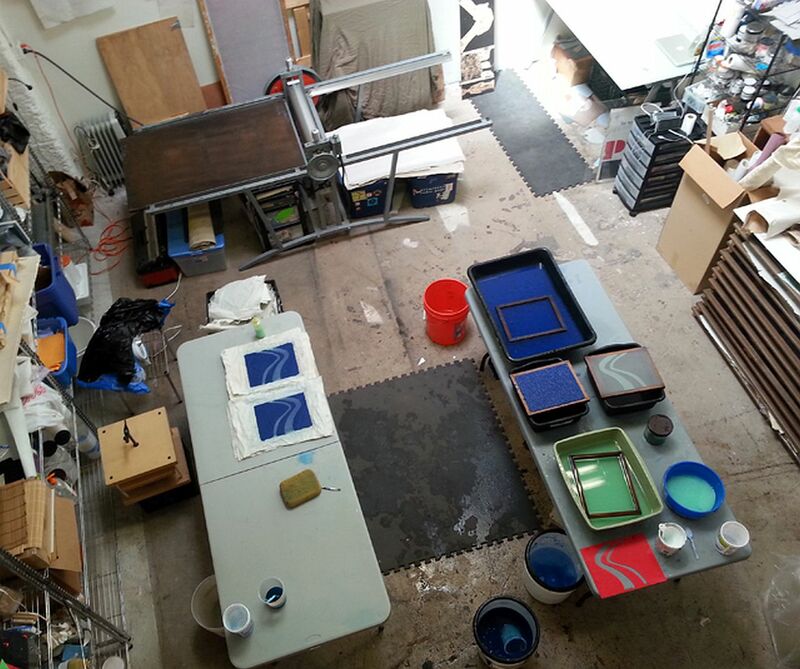 This photo is an in-process shot of papermaking and pulp stenciling. The view is from the loft above the main workspace. There is a Meeker-Mcfee press in the top left, and out of the picture is a Davis-Hodges Hollander beater for papermaking. Next to the loft in the ceiling is a skylight, which provides almost cathedral-like light. Since I’m in earthquake territory, all bookshelves are screwed directly into the wall. The glass table where I mix my ink in the top right of the photo actually shattered recently in an aftershock from the Napa Valley quake we had out here, shortly after I took this photo. It has since been replaced. I make all the paper for my projects by hand, either from recycled fibers such as blue jeans, plants I grow myself, or invasive regional plants I harvest. So a big part of my studio is the outdoors, either where I’m growing something or where roaming around, using my studio practice to clear space for native habitat. After which, I return here to process. This is my studio in my apartment on the Lower East Side of Manhattan. It’s not huge, but really functional and convenient. I’ve had all kinds of studio situations, large and small, outside of the house, but this set up has been the most productive. Most things are on wheels, so things can be put away or pulled out whenever they need to be used/stored. Right now it’s a huge mess from framing and packing some work to ship, but honestly it’s usually pretty messy. Sadly I’ll be moving it all soon, as after 23 years my lease was not renewed. Soon there will be no working artists in the LES at all. I wanted to send this in to commemorate the space before it is gutted and turned into luxury apartments.